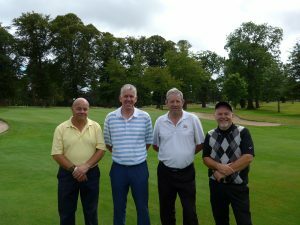 Liberton’s great run in the Seniors Inter-Club came to an end today in the final against Royal Burgess GC. An excellent performance from a very strong Royal Burgess team was just too much for our team of Neil Plenderleith, David Rennie, Malcolm Stevenson and George Wither. The boys can be justly proud of themselves for the way they played all week. Many thanks to George Inglis for his team management and for the on course support from Brian O’Neil, Dougie Russell, Bill Kent and Mark Kedar.